The home plate gate entrance at Angels Stadium features a full-size brick infield and pitcher's mound. Roy, right, and his grandson Mathew wait outside the stadium before the game. Roy is an Angels fan and Mathew is a Dodgers fan. They say they don't let their competing team affiliations affect their relationship, however. Fans prepare to catch an incoming home run ball during batting practice. Dodgers pitcher Kevin Correia signs an autograph. Mike wears a straw hat with pins affixed to it. "Every pin has meaning to me," he said. From right, Christian, Max, Cole and Anthony hold up signs during the game. It was Christian's birthday and his dad David (not pictured) took him and his friends to the game. One the wall is a poster with photos of when current Angels Mike Trout and Chris Iannetta played in little league. A fan wears a foam hat attachment in the shape a trout, a show of support for Angels outfielder Mike Trout. Nathan took his son Tim to his first game. 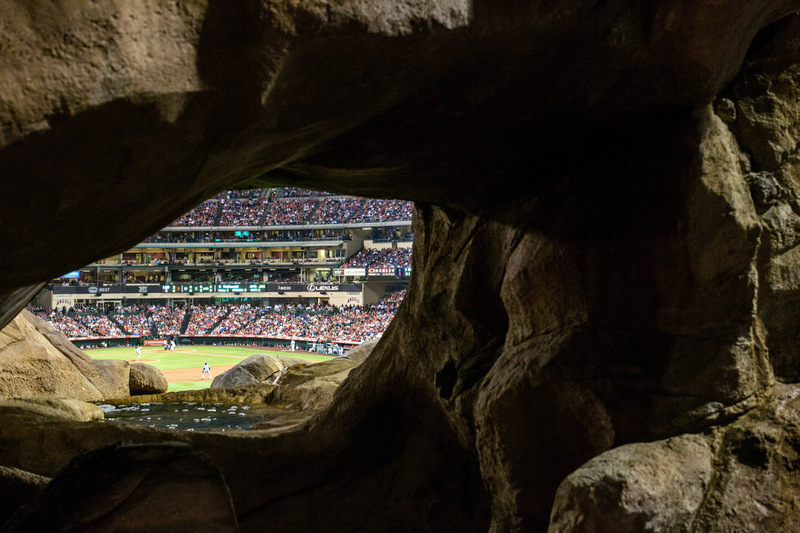 Beyond the left-centerfield wall is the "Outfield Extravaganza," which contains a rock formation similar to those found on some California beaches. Tom, an usher, smiles while dancing with a stuffed Rally Monkey doll in his hand. The Rally Monkey is a superstitious object that the Angels incorporate into their late inning cheers. 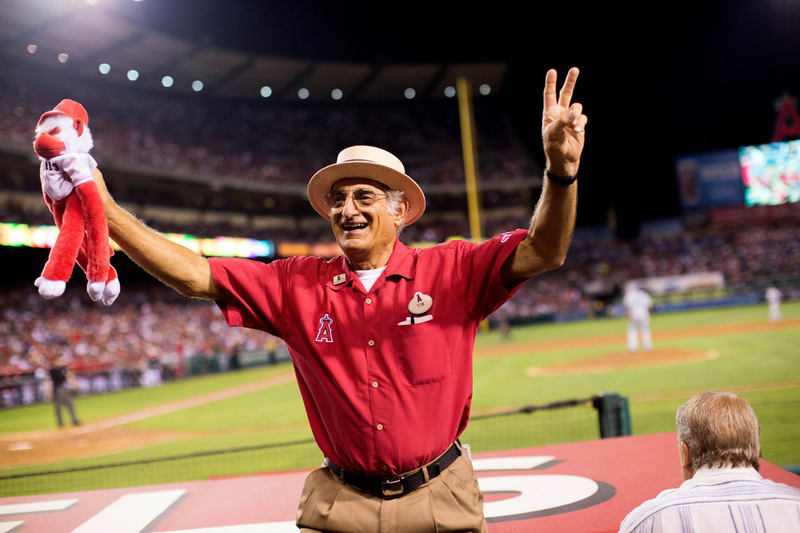 If the Angels are losing by fewer than three runs after the seventh inning, the scoreboard will say "If you make noise, he will come." If the fans cheer, videos of Katie the white-haired capuchin monkey displaying comedic and aggressive behavior play on the video screen. The Dodgers celebrate their victory over the Angels. Robert Brandon shields a statue of former Astros second baseman Craig Biggio from the rain with his umbrella. The main entrance to Minute Maid Park is through the building that once was Houston's Union Station. Tony Solis wears a chain with a medallion in the shape of the Astros logo that his dad purchased for his birthday. A's first base coach Tye Waller throws a ball to a fan. Astros second baseman Jose Altuve holds a ball with a split finger grip as he walks off the field. Asher, 7, ordered shaved ice at the game. Urijah, left, Patricia and Elijah sing the Star-Spangled Banner. An old-school Route 66 gas pump in the left-centerfield concourse keeps track of all Astros home runs hit at Minute Maid Park. Samantha and Cooper, 2, share a laugh after singing "Deep In the Heart of Texas." Minute Maid Park is the only ballpark with an inclined hill in the outfield. It's a tribute to Navin Field, an old baseball field in Detroit that also had a hill. On the hill, there is a padded flag pole that is in play. No other stadium is designed this way. April reacts after the Astros relinquish the lead to the A's. A train conductor encourages the fans to get loud and support the Astros in the ninth inning. The conductor drives the train on a track from center field to left field whenever an Astros player hits a home run and whenever the Astros win. The train is an homage to Houston's historical importance as a train transportation hub in the 19th and early 20th centuries. AT&T Park is a flat-out beautiful place to watch a baseball game. Looking out from the upper deck stands behind home plate, you see the San Francisco-Oakland Bay Bridge beyond the left field wall and the San Francisco Bay water all around the outfield. A small portion of the bay just beyond the right field wall is called McCovey Cove. It's named after one of the Giants' most prodigious power hitters, Willie McCovey, who, as a lefty, would have hit many home runs into the cove had this stadium been open when he played. During batting practice and games, fans in kayaks wait for home run balls to come rocketing out of the stadium. One man, Joe, comes to almost every home game with a fishing pole and net to catch any "splash hits," the term for home runs landing in the cove. The outfield seats are situated below the outfield concourse, leaving views of the bay fairly uncluttered. From my observations, every seat, infield and outfield, upper deck and lower, offers a great view of the game. The stadium design is quite similar to the retro modern style of Camden Yards. The green steel and red brick construction combined with the accessible downtown location and aforementioned water views make this stadium one of the most picturesque in baseball. In this in-state competition between the Dodgers of Los Angeles and the Giants of San Francisco, the Dodgers came out ahead. Yasiel Puig hit three triples, a feat only achieved 15 times since 1950, and the Dodgers rolled to an easy victory. Final Score: Dodgers 8, Giants 1. Joe Dirt has snared 26 splash hit home runs in McCovey Cove with a fishing rod and net, including Barry Bonds' 725th homer. A trolley once used to transport San Francisco residents sits in the right-centerfield concourse for fans to relax on and eat during the game. From left, Dave, Nina, Kaiden and Kylie, hang out on the trolley before the game. It was Kaiden's first MLB game. Kylie, who plays catcher in softball, said her favorite player is Buster Posey. Abel and Gloria have been married for 17 years. On one of their first dates, they went to a Dodgers-Giants game. Zack Greinke warms up before his scheduled start that night. Clowns Hiccups, left, and Hoppers, right, cross the street before the game. Fans try to get a ball from outfielder Hunter Pence before the start of the game. McCovey Cove Dave, left, has corralled 22 of the home runs hit into McCovey Cove. He's paddled out to almost all home games since 2005. Another home run-seeking kayaker on his right brings bread for seagulls and they sit on his kayak. A fan, center in orange, reenacts a recent play in which a fan interfered with a ball hit by Yasiel Puig. John is a fourth-generation San Franciscan. He trims trees for the city and has been dressing up and carrying a flag at games since 2010. Jamie, right, held her bachelorette party at the game with 40 of her friends. A man came up to her with a violin and said "Can I play you a song?" She said yes, and she did an Irish dance with her friend Tracey, center. Paul is an usher from San Francisco. He's in his first season with the Giants and said he's really loving it. His last job was working at McDonald's. Outfielder Yasiel Puig balances a ball on his hand in between innings. Rumaldo shows his son, Rumaldo Jr., how many more outs the Dodgers needed to secure the win. Max, right, sold 50 cups of hot chocolate at the game. He said he didn't sell as much as he usually does because the Giants were losing. In a word, Yankee Stadium is majestic. The lattice, arches, white stone, tall ceilings and humongous banners combine to create the feeling of being inside a baseball cathedral . The Yankees have more than double the number of World Series wins of any other team (27 to the Cardinals' 11) and it is fitting that the stadium design reflects their dominance on the field. Though the stadium is relatively new, it contains so many historical references to the great players who won those 27 championships that it would be easy for someone to confuse the age of the stadium. The dimensions are the same as the Yankees' previous stadium, also called Yankee Stadium, and while there have been significant upgrades to stadium accessibility, the design and location is largely the same. This is Derek Jeter's last season and in this trip I will get to see him play four times (Chicago, Kansas City, Texas and New York). Seeing him at home, however, was truly special. As Jeter stepped into in the batter's box, a recording of longtime Yankee public address announcer Bob Sheppard introducing Derek Jeter played through the stadium speakers and the crowd gave him a standing ovation. Jeter has used the recorded introduction in all his home at-bats since Sheppard passed away in 2010. There are a million different ways to define "best," but I think Derek Jeter is the best all-around player of my generation, and his well-deserved reputation as a winner and leader both on and off the field qualifies him as one of baseball's sure-fire first ballot Hall of Fame greats. Final Score: Yankees 2, Rangers 1 (14). Leon and Lina have been married for 7 years. Leon was in a motorcycle accident that left him paralyzed in 2009. Tyler Clarke throws batting practice to Jamel (not pictured) on a field across the street from Yankee Stadium. Yostin and Elmer (not pictured) shagged batted balls in the outfield. A merchandise store on the lower level concourse sells Yankee jerseys from players of different eras. A policeman stands on the field before the game. Just beyond the center field wall, Monument Park commemorates Yankee greats. Number 3 belongs to Babe Ruth, one of the greatest players of all time. Fans walk past a photo of Babe Ruth and Lou Gehrig. A cotton candy vendor walks through the upper concourse while balancing the candy on his head with no hands. Carlos Beltran hits during the game. From left, Diego, his son Diego Andres and nephew Albert watch the trajectory of a Rangers player's home run. Diego and Diego Andres live in the Dominican Republic and had never before attended an MLB game. Fans cheer in the bleachers. Chase Headley gets doused in Gatorade after hitting a walk-off single to defeat the Rangers in the 14th inning. Marlins Park is the newest stadium in Major League Baseball. The stadium design is a departure from the retro stadium style of the past 20 years. Marlins owner Jeffrey Loria is a modern art collector and the stadium design reflects his taste. Around the stadium, there are various modern art pieces from Joan Miro, Roy Lichtenstein, Kenny Scharf and Red Grooms. The Red Grooms piece is the most prominent, a gigantic colorful piece in center field that spins whenever a Marlin hits a home run (photos below). While there has been strong criticism of the stadium, I think it will grow on fans as its modernness becomes more common. Final Score: Giants 9, Marlins 1. Jawaan, a roasted nut usher in his first season, looks on during batting practice. A reproduction of Roy Lichtenstein's "The Manager" from 1963 hangs in the stadium. Marlins owner Loria is a modern art dealer and the stadiums has several modern art pieces displayed around the stadium. Members of the Aces 10U baseball team from Puerto Rico play hand games before the Marlins game. Angel the crab and Spike the Red Sea dragon pose for photographs. In the concourse behind home plate, there is a bobble head doll museum that contains 588 dolls from all 30 teams. Red Grooms designed the home run sculpture in Center Field. Alfred Smith sells beer during a t-shirt toss. Balls hit by Giancarlo Stanton in batting practice left dents in the metal wall of the bar in left-center field. Carolina, right, Jonathan and his son Johan watch the game. A man jumps in the air after catching a foul ball. The Miami Marlins Energy Team. Lydia and Tony Jimenez kiss for the "kiss cam" on the jumbotron. They are frequently featured as the last couple and draw ravenous cheers from fans. Last year they attended all 81 games. They met in Puerto Rico and have been married 61 years. Opened in 2009, Citi Field is tied with Yankee Stadium for being the third-newest stadium. One of the most unique parts of the stadium is the color of the foul poles. The Mets are the only franchise in baseball to paint their poles a color other than yellow. You can see my photo below to figure out what color they paint it. Additionally, a giant retractable apple sits just behind the center field wall, an homage to a similar-looking retractable apple at the Mets' previous ballpark, Shea Stadium. The main entrance to the stadium is a rotunda that serves as a beautiful tribune to Jackie Robinson. In Monday night's game, Mets pitcher Daisuke Matsuzaka threw a gem, allowing no runs in 7 innings. The bullpen, as has frequently been the case for the Mets this year, gave up the lead the following inning. Mets outfielder Curtis Granderson boomed a home run to tie it at three in the bottom of the eighth. Neither team scored in the ninth the game went into extra innings, a first in my trip. In the 11th, Mets shortstop Ruben Tejada singled home Juan Lagares to win it. Fans enter the stadium through the Jackie Robinson rotunda. Jay holds his son Luca up on his shoulders. Nick Giampietro, known better as "Pin Man," wears a jersey with more than 100 pins on it whenever he goes to a game. He has season tickets and comes to almost every Mets home game. He works in a deli as his daytime job. Some of the walls at Citi Field have photo collages of former Mets players on them. Sol Gibbons and his daughter Fran Nuchims watch the game. They've been coming to games together since she was a kid. The Mets are the only team in baseball to have foul poles that aren't yellow. Here, Eric Young Jr. looks out before the start of an inning. Speed pitch in the left field concourse. Vendor Peter Tehomillic sells cotton candy and cracker jacks in the upper deck. Former volunteer fireman Vernon Gibson is know at Citi Field as the New York Mets Fireman Koooler. You can usually find him on the Shea Stadium bridge. In some ways, he's like the Mets version of the New York Jets' Fireman Ed. Anita Bess and her husband Freddie are lifelong Mets fans from Brooklyn. It was Military Monday, a Mets initiative to honor servicemen and women on home Mondays. Freddie, a former Marine who served in 1968, and all his fellow service members were acknowledged during the game. Mets shortstop Ruben Tejada singles home the winning run in the 11th inning. Braves fan Sara looks on as the Mets threaten to score. Mets outfielder Curtis Granderson who tied the game in the eighth inning with a solo home run high fives with teammates after the win.